Rather like the hot pepper, basil is not a plant but an obsession—nearly a religion. There are now, by scientific count, more varieties of basil for sale than American tourists in Rome annually (well, maybe not quite, but close—we counted over two dozen varieties, even omitting slight name variations, from just five catalogues, and another source refers to over 150 varieties!). Besides real basils (commonly, if misleadingly, called “sweet basil”), there are some close cousins usually called “basil” as well: O. minimum, “compact” or “globe” basil, generally regarded as notably inferior culinarily to real basil; and O. sanctum aka O. tenuiflorum, “holy” or “sacred” basil, a camphor-like Asian herb rarely used for culinary purposes even in its home lands. There are also some of better culinary quality, such as Thai lemon basil (O. citriodorum), which has a balm-like flavour, lime basil, and another lemon basil (O. americanum). As they say on television, “But wait! There’s more!” Perennial basil species from Africa (O. kilimandscharicum) and Asia (O. canum) are now appearing, at least in Europe; they are said to have a strong, but less-pleasant flavor than real basil. And beyond them, hybrids of those and classic Mediterranean basils are appearing too. Apparently the herb has reached fad status, and any plant that can scrape a justification for the word “basil” in its name is, regardless of culinary virtue or the lack thereof, now destined for stardom. Even within the true sweet basils, there are quite a few varieties with clearly different flavors. It is, however, our feeling, with which others may well disagree, that one uses basil for the highly distinctive—virtually unique—flavor of…basil…and that if one wants overtones of other flavors, from lemon to cinnamon to anise, one can use other herbs and spices to add those flavors to one’s dish in exactly controlled amounts and proportions. The chiefest of the sweet basils—the “real” basils, if one wants to put it that way—are the kinds from the area of Genoa, Italy. Of those, one common, widely recommended offering, sold under several similar names, is Sweet Genoese (aka Genovese Profumitissima). Yes, Virginia, unless you’re a compulsive-collector personality, you really only need one basil type. Like most herbs, basils want soil that is very well-drained, but more nearly poor than rich (poor soil concentrates the essential oils that give the wanted flavor). Many sources say it wants a rich soil, but we suspect that is a knee-jerk phrase, because the real experts seem to disagree with it. Basil germinates easily. Place the seed on the soil, barely cover it with some sifted soil or sand, water, and wait. Keep it warm and sunny (it doesn’t like cold at all) and pretty soon, you’ll have a basil plant. Be sure to grow your basil in a warm, thoroughly sunny spot. If you’re growing it outdoors, you’ll have a limited season indeed, for the plant is very frost-sensitive. Because basil grows fast and is likely to be used quite a bit, it is wise—especially if growing basil in pots indoors (which we recommend)—to seed a new one every few weeks at most, probably a lot more often. Indeed, you might want to grow it in pairs or trios if you really use it heavily. For container growing, estimates vary but generally seem to work out to about needing a 6-inch-square space per plant (that’s 6" by 6", not 6 square inches); that means, for example, about three plants in a 12-inch-diameter pot. That’s a little crowded, but it seems to work. Remember, you can crowd annuals a little more than perennials. Water basil well, but don’t give it the dreaded “wet feet”: moist, not wet. Keep the plants in full sun. Do not fertilize them. 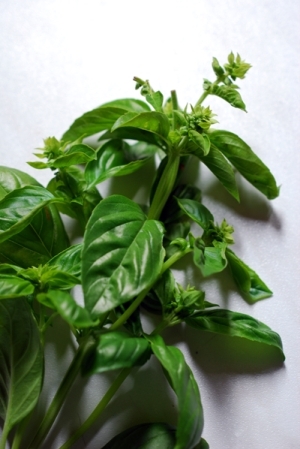 To promote bushy growth, pinch basil plants off at the growing tip as soon as 6 pairs of leaves have formed (usually at about 8 inches in plant height). When flowering starts, pinch off each flowering shoot, along with the leaf pair directly below (which should be used at once). It does not seem to be well known that the flower buds are as flavorful as or even more flavorful than the leaves, and should also be used in cooking. You loaded this page on Friday, 19 April 2019, at 16:25 EDT. It was last modified on Monday, 4 February 2019, at 01:27 EST.